Stay in touch with your customer by broadcasting group SMS!!! Now you can easily send targeted messages to your customers directly on their mobile phone by our Mac Bulk SMS Software. 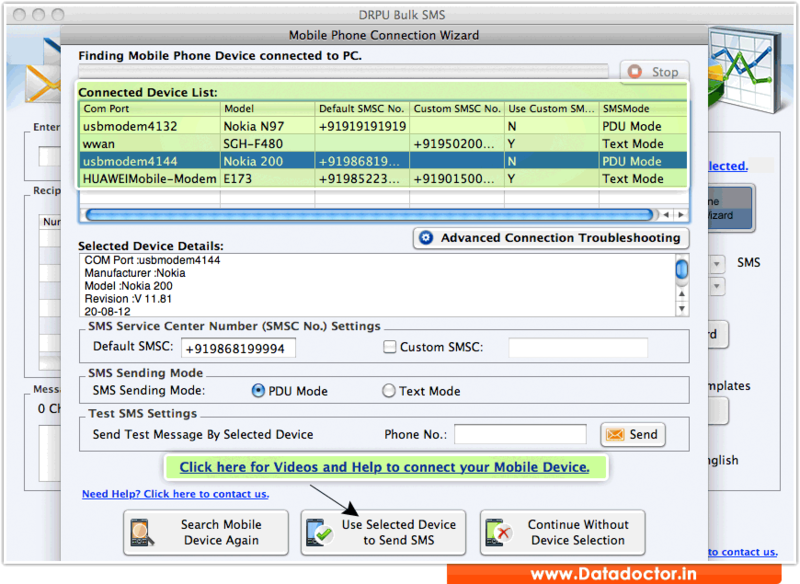 With Mac Bulk SMS software for GSM Mobile phones you can compose and send group text messages from both Mac Intel and PowerPC based Mac OS X computers using GSM technology based mobile phone. Macintosh SMS sender program successfully sends bulk numbers of text messages over worldwide location without requiring internet connection. SMS text messaging program provides facility to skip duplicate number entries during SMS broadcasting process. » Send notification and standard SMS: Send notifications and standard messages over national/international mobile networks. » Inbuilt delayed delivery option: Provides inbuilt delayed delivery option to customize the load of bulk SMS broadcasting. » Sends text SMS in different languages: Support Unicode characters to send SMS over worldwide location in different text format as per your need. » Saves sent text messages to templates: Provides facility to save sent text SMS details to templates which can be viewed later whenever required. » Exclusion list wizard option: Maintains list of contacts or group during bulk SMS sending procedure using exclusion list wizard facility. ① Allows you to send standard messages, notification, event alert, stock update details, reminders, product promotion details and personalized SMS. ② Helps to advertise your business product as well as services. ③ Increases your business profits and sales by broadcasting group SMS to your global mobile customers.